Omega-3 Fish Oil Helps Protect Against Dementia. A Loyola University Chicago Stritch School of Medicine study suggests that Omega-3 fish oil helps protect the brain from alcohol related dementia. Researchers found that omega 3 helps protect the brain from against inflammation and cell death. Previous studies show that omega-3 fatty acids or polyunsaturated fatty acids (PUFAs) are important for brain function, as well as normal growth and development. 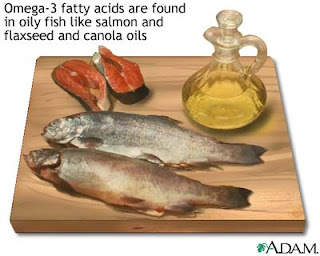 Omega-3 fatty acids include the nutrients called docosahexaenoic acid (DHA) and eicosapentaenoic acid (EPA). They have also been found to reduce the risk of heart disease. The American Heart Association (AHA) has recommended eating fish (particularly fatty fish such as mackerel, lake trout, herring, sardines, albacore tuna, and salmon) at least twice a week. A study a year ago published in Neurology, shows that a diet lacking in omega-3 fatty acids, may cause the brain to age faster and lose some of its memory and thinking abilities. Dementia is the loss of brain function that occurs with certain diseases. It negatively affects memory, thinking, language, judgment, and behavior. It causes a serious loss of global cognitive ability in a previously unimpaired or normal person that is beyond what might be expected from normal aging. Previous studies have shown that long-term alcohol abuse increases the risk of dementia. The Loyola study found that in the brain cells of rats exposed to high levels of alcohol, a fish oil compound protected against inflammation and cell death. The study by Michael A. Collins, PhD, and colleagues was reported Sept. 8 at the 14th Congress of the European Society for Biomedical Research on Alcoholism in Warsaw. It appears that small amounts of alcohol might, in effect, make brain cells more fit. Alcohol in moderate amounts stresses cells and thus toughens them up to cope with major stresses down the road that could cause dementia. But too much alcohol overwhelms the cells, leading to inflammation and cell death. In the new study, Collins and colleagues exposed cultures of adult rat brain cells to amounts of alcohol equivalent to more than four times the legal limit for driving. These cell cultures were compared with cultures of brain cells exposed to the same high levels of alcohol, plus a compound found in fish oil called omega-3 docosahexaenoic acid (DHA). Researchers found there was about 90 percent less neuroinflammation and neuronal death in the brain cells exposed to DHA and alcohol than in the cells exposed to alcohol alone. Further studies are needed to confirm whether fish oil protects against alcohol-related dementia. "Fish oil has the potential of helping preserve brain integrity in abusers," Collins said. "At the very least, it wouldn't hurt them." But Collins added that best way for an alcohol abuser to protect the brain is, if possible, to quit drinking or cut back to moderate amounts. "We don't want people to think it's okay to take a few fish oil capsules and then continue to go on abusing alcohol."